Place milk and pudding mix in a medium bowl and whisk with a wire whisk for 1 minute. Refrigerate until set, about 1 hour. Place graham crackers on a sheet of waxed paper. Melt butterscotch morsels and shortening in a microwave in a microwave-safe bowl for 1 minute on high; stir until no lumps remain. If there are lumps, microwave on high an additional 30 seconds. Pour melted butterscotch over graham crackers, spread to coat evenly. Chill until butterscotch is set. 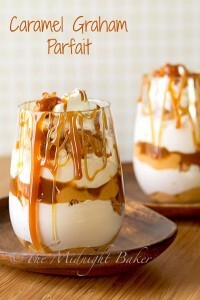 Fold 1 cup of butterscotch pudding into the 2 cups of whipped topping. Break the butterscotch-coated grahams into small pieces. Decorate top with a dollop of whipped topping and any remaining graham bits. Drizzle remaining caramel sauce over the top.